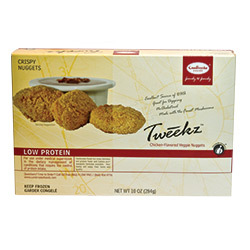 Description: Each carton contains 9 nuggets or 3 - 3 nugget (96 g) servings of oval-shaped Imitation Chicken Flavored Tweekz. Add ease and taste to your meals with these imitation chicken flavored breaded veggie pieces made to resemble the popular chicken nuggets that are on the market. Now with 32 mg of DHA per serving. Conventional oven (recommended): Preheat oven to 375º F. Place frozen nuggets on baking sheet and bake for about 10-15 minutes or until crisp. Serve hot. Stove top: Pan-fry lightly thawed nuggets in hot oil, turning occasionally for about 3-5 minutes, until crisp. Drain on paper towels. Serve hot. Serving Suggestions: Serve for lunch or dinner as main entre item with a favorite low protein side dish. Use for sandwiches or meat substitutes in casseroles. Ingredients: Mushrooms, water, breadcrumbs (wheat starch, water, psyllium, canola oil, polydextrose, sugar, baking powder, methylcellulose, yeast, xanthan gum, salt, preservatives [calcium propionate, potassium sorbate, fumaric acid, sorbic acid], cassava flour), canola oil, sauce blend (water, soybean oil, vinegar, sugar, modified cornstarch, eggs, less than 2%: salt, mustard flour, paprika, spice, natural flavor, potassium sorbate [preservative], enzyme modified egg yolk, dried garlic), batter blend (water, wheat starch, canola oil, fully hydrogenated cottonseed oil, sugar, polydextrose, baking soda, sodium acid pyrophosphate, monocalcium phosphate, methylcellulose, salt, xanthan gum, natural flavor), xanthan gum, guar gum, seasoning blend (salt, dextrose, monosodium glutamate, yeast extract, canola oil, parsley, maltodextrin, extracts of turmeric and paprika, natural flavors, sugar, soy sauce [soybeans, wheat, salt], less than 2%: sodium silico aluminate to prevent caking), potato starch, sago starch, DHA algal oil (high oleic sunflower oil, sunflower lecithin, tocopherols and ascorbyl palmitate [as antioxidants]), sage. Contains egg, soy and wheat.